While it's no longer the secret getaway spot it once was, Caye Caulker is an increasingly popular travel destination on the coast of Belize. Located within easy distance of Ambergris Caye, the small island is only five miles (8km) long and less than one mile (1.6km) wide. Getting around on Caye Caulker couldn't be easier; everything is within walking distance, and there are bicycles and golf carts available for hire. More laid-back than its larger neighbour, Caye Caulker is only beginning to be developed for tourism, and is still more popular with backpackers and budget travellers for its cheaper prices. The island is split in two by a narrow channel, with most of the infrastructure located on the southern half. Don't expect a bustling metropolis though: the closest thing to a town is three sandy streets, and a handful of bars and restaurants serve as the only nightlife. Fishing, kayaking, sailboating, kite surfing, scuba diving, and snorkelling are the main activities here, and you can spot sting rays, nurse sharks, and manatees in the water. 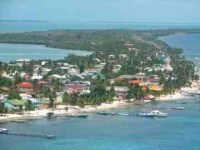 Caye Caulker gets busy in the summer on long weekends, and during the annual Lobsterfest, held each July.